The test station consists of a 200 mm square post with explanatory text, a terminal board with contact clamps, a cover (for process pipelines and tanks), a poster cover/one-kilometer sign (for the infrastructure of the main pipelines) and anchor device. Optionally, board-sign can be installed on the TS. Posts are made of polyvinyl chloride (PVC) based polymer material in two versions. 01 type TS post consists of a solid-drawn section with terminal board hatches, installation opening, auxiliary equipment, closed with covers. 02 type TS post consists of 2 half-posts of a solid-drawn section connected with a lifting and sliding mechanism. The lifting and sliding mechanism of the post is made of corrosion-resistant metal to ensure trouble-free operation throughout the service life of the TS. The materials used in the posts are specially designed for outdoor use in all climatic zones. 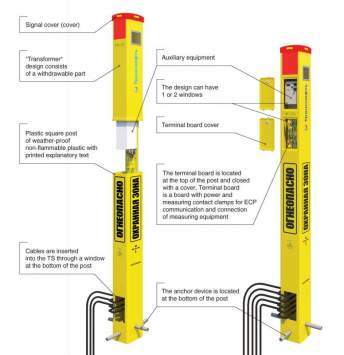 Posts are equipped with anchor devices preventing free removal of the Test station from the ground. Depending on the purpose and conditions of use, TS is equipped with the appropriate quantity of power and measuring contact clamps. The terminal board is made of glass fiber plastic. Contact clamps of TS terminal board are made of non-ferrous metals (brass). 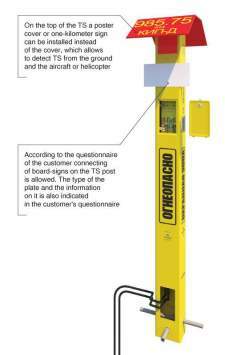 The post design eliminates the access of unauthorized persons to the terminal board, installation opening, and additional equipment. Hatches covers are equipped with a lock made of corrosion-resistant metal, with a universal key. Explanatory text is made by full-color printing, using ultraviolet radiation (fading) resistant inks, that provide image resistance to climatic factors for at least 10 years from the start of operation with a warranty period of 5 years minimum. All explanatory texts of TS are factory applied. Manufacturer CJSC "Pipeline systems and technologies"
0 - no additional equipment.